There are few moments more breathtaking than that first moment when a groom catches a glimpse of his bride walking down the aisle. That’s why the venue and the backdrop for any wedding must be just right. Weddings held at venues along Kentucky Lake and Lake Barkley fit the bill for almost any occasion, from wedding rehearsal dinners to ceremonies and receptions, both large and small. Here are a few destinations you’ll want to explore before selecting the site for your special day. Despite a fire that destroyed the restaurants at Patti's 1880's Settlement, the wedding chapel and gazebo continues to offer brides unique venues to host weddings. Brides will find planning their wedding here a cinch, with catering on site and cake and dessert options readily available for receptions. 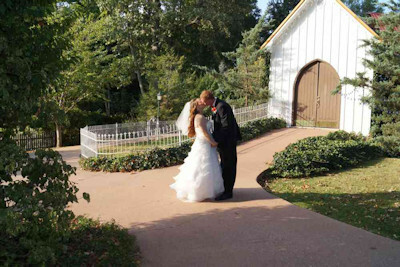 The rates at Patti’s are affordable, allowing the bride and groom to enjoy their day, while keeping within their budget. Patti’s is located in Grand Rivers, Kentucky. Shopping and other tourist destinations are within walking distance, making it a friendly destination for the entire family. Request more information on planning a wedding at Patti’s on their website. If you’re looking for one of the most elegant venues in which to host an outdoor wedding or reception, then look no further than Kenlake State Resort Park located near Hardin, Kentucky. This lakefront resort is situated on the glistening waters of Kentucky Lake. Guests of Kenlake can almost always find wildlife within view, creating a serene backdrop to any wedding. The park is home to six outdoor wedding venues, each offering a unique experience filled with natural beauty. The Kenlake Hotel is conveniently located onsite, which makes it easy to host bridal parties and out of town guests. If you’re looking for something entertaining for your guests to do before or after the ceremony and wedding festivities have ended, Land Between the Lakes National Recreation Area is just moments away. LBL is loaded with hiking and bike trails, and provides a multitude of memorable outdoor experiences for visitors. Find more information online. The Community Center rental fee includes tables and chairs. Find more information and photos on their Facebook page or call 270.362.8272 to reserve the facility. Located near Lighthouse Landing, the Jetty located in Grand Rivers creates an elegant backdrop to any wedding. The jetty overlooks Kentucky Lake, creating a gorgeous panorama of sites to accompany any wedding ceremony. The gazebo is the perfect place to host small events and ceremonies. You can call 270.362.8272 for more information or to reserve this lovely, outdoor space. If you are wanting a truly rustic and outdoor wedding experience, the vast, uninhabited wilderness of Land Between The Lakes may just be what you're looking for. LBL, managed by the US Forest Service, allows wedding ceremonies to be performed in this national recreation area. However, depending on what you plan to do during your wedding ceremony, you may need to obtain a Special Use Permit. For instance, weddings of more than 75 guests, or those ceremonies which include live or recorded music or a catered meal, will require a permit. Folks are allowed to host a ceremony almost anywhere in the park, except for the Homeplace, Nature Station, and St. Stephen's Church. Piney, Wranglers, Hillman Ferry and Energy Lake campgrounds are all available for wedding ceremonies. For more information or to obtain a permit, call 270.924.2044. Everyone wants their day to be the perfect day. Kentucky Lake is a great location to host an event for a small group or a large wedding. Your guests and attendants will enjoy the many amenities and recreational opportunities the region has to offer. They will also appreciate the top quality overnight accommodations located nearby. No matter where you plan to host your ceremony, Kentucky Lake and Lake Barkley offer the best setting for anyone seeking something unique and special for their big day!